Go "Straight-Up" for the Holidays! Select a blog entry Ken's Type-1 Diabetes Journey Ken's Type-1 Diabetes Journey-2: Disclaimer Plant based motivations face-to-face Help! 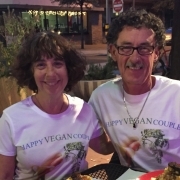 I'm married to a meat-eater! Taming the cravings Is eating meat macho? Wild Claims Vitamin B12: It’s not just for meat-eaters anymore. Ken’s Type-1 Diabetes Journey Part 3: What is Type-1 Diabetes? Do I have to suffer silently to respect the self-destructive choices of others? Ode to Chocolate Vegan Isolation Where there is life, there is hope! Carbophobia Ken's Type-1 Diabetes Journey: Part 4 - My Story Popular (but potentially unhealthy) “health” foods Ken’s Type-1 Diabetes Journey Part 5: Living With Type-1 Diabetes Ken’s Type-1 Diabetes Journey Part 6: Glycemic Index and Attention Span Be Careful What You Pray For! Sacrifice? !